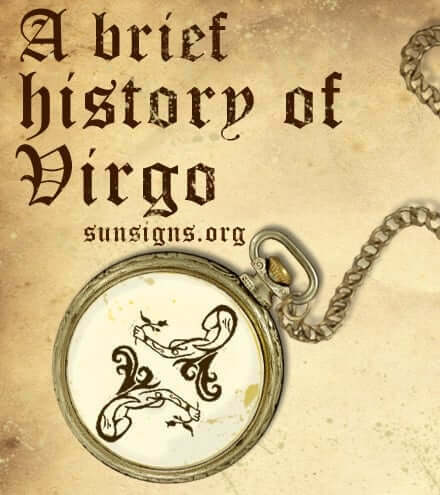 Virgo is the sixth sign of the zodiac, and covers people who were born from August 22 to September 23. Symbolized by the Virgin, people under this sign are considered demure, analytical and perfectionists. And as one of the earth signs, they are seen as practical and grounded in reality. Virgo sits in the 150-180th degree of celestial longitude, between the constellations Leo and Libra. It is regarded to be the second largest constellation in the sky, and its recording dates back to ancient Babylonian times. Here it was known as “The Furrow,” referring to the goddess Shala’s ear of corn. One of the stars in the constellation, Spica, means ear of grain in Latin. The Greeks and Romans associated Virgo with Demeter and Ceres respectively, both of whom were the goddesses of fertility and agriculture. Most cultures viewed this sun sign as the symbolism of harvest and agriculture, as it comes at the end of summer and goes into fall. There is also the story by Ovid of goddess Astraea. She associated with innocence and purity, who fled the wickedness of humanity and ascended into the heavens to become Virgo. This kind of association may be why the Virgin Mary was connected to the zodiac sign in the Middle Ages. The other aspects of this sign, the earth element and the mutable modality, have to do with how nature has been broken down. Where Virgo falls is at the end of summer, when change is about to happen in nature. Things are in flux as temperatures begin to fall and the sun is not as high in the sky. People have begun to harvest what they planted in the early spring, and get ready for colder temperatures and harsher conditions. Because of this, the Virgo star sign person is seen as steady and trustworthy who works hard to accomplish all they can in the time allowed. This is where Mercury comes in, and they share in his tireless efforts to obtain a lot of information and use it to the best of their ability. Another set of zodiac traits associated with the Virgo astrology sign are the intestines and nervous system for anatomy, mercury for the metal, and blue or beige for color. The intestines process the food we digest and the nervous system is what sends signals all over the body to accomplish tasks. The metal stems from the ruling planet and the color represents the changing sky from brighter yellow to darker blue. Those born under the Virgo star sign are connected with those who had to work the fields and get the homestead ready for the changing weather. The Virgins are methodical and hard-working, and pay attention to every little detail. It is this history that has led Virgos to be sturdy and resolute, for they can feel the shift in the natural order of things. The wind is getting faster and it’s time to bring in the crops from another season. There’s no room for hesitation or laziness, and those born under this sign know when it’s time to get things done. They will adapt to their surroundings and survive another year. 5 Signs You Should Be Eating More Protein!